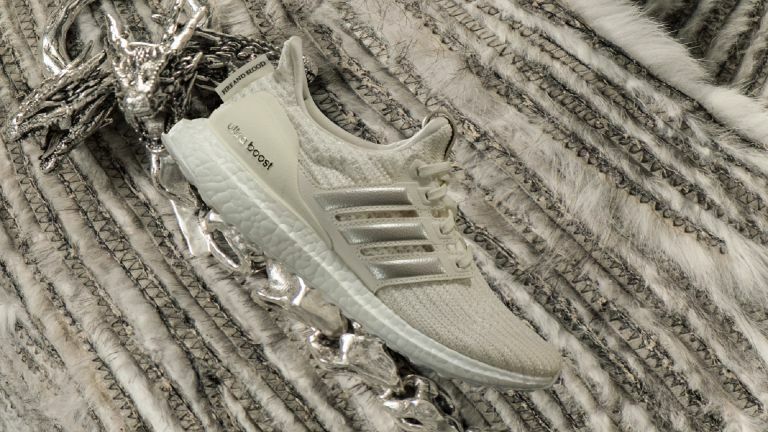 Following months of rumours, Adidas has launched a limited-edition collection of its poplar Ultraboost running shoe, inspired by hit HBO TV series Game of Thrones. The Adidas x Game of Thrones Ultraboost collection features six new shoes, priced at £149.95, each representing different families and warring factions of the Seven Kingdoms and beyond The Wall. Aptly for a series where much-loved characters are killed off at the drop of a hat, three of the shoes' colourways have sold out already. So if you want a pair, you'd best get a move on, like a peasant fleeing the man-eating dogs of Ramsey Snow. Even the lines that are left will soon only have sizes left to fit Tyrion or the Mountain. The 'White Walker' colourway: ice cool? References to the Game of Thrones world can be seen through a range of design details. The symbol of each faction can be found on the tongue, there's a motto on the heel tag, and each shoe sports a distinct colourway inspired by the house or group of characters. The black-and-scarlett House Targaryen shoe, for instance, gives a nod to the three-headed fire-breathing dragon, while the White Walker shoe is appropriately white, black and icy blue. The only question is whether these are running shoes for fast-moving athletes such as Arya or more the kind of stylish trainer that man-about-town Tyrion might wear while at his favourite nightclub, or brothel. The Adidas x Game of Thrones Ultraboost collection features Adidas’ signature Boost foam midsole technology for extra bounce and better energy return, a sock-like Primeknit upper for lightweight performance, and the iconic three-stripe midfoot cage and heel counter to support your foot. As with other shoes in the Ultraboost line, they straddle the line between sport and fashion – meaning they're just as comfortable for daily wear as they are pounding the pavements.